If you've had HBO for more than a few minutes, then you know that they show the same things over and over. Even with six or seven different HBO channels, things get repetitive. It was like decades ago when there was just one HBO. That didn't stop people like me from watching the same things over and over. I've got a laundry list of movies that I love and can't quote from start to finish simply because they were on HBO seemingly every day. (My wife can't grasp why I love some of these movies, but you just had to be there.) One such film was Watership Down. I first watched it simply because it was an animated movie. I quickly learned that it was much more. Hazel (voiced by John Hurt) and Fiver (voiced by Richard Briers) are rabbits who live in a seemingly common warren. However, Fiver, who is prone to visions, feels that the warren is in danger and he begs his brother to leave with him. Hazel takes this to the elder rabbits, but he's re-buffed. So, Hazel and Fiver, along with a few other rabbits, leave after dark. They are confronted by Bigwig (voiced by Michael Graham-Cox), a guard rabbit, who also decides to join them. Fiver has a clear idea of where they should be going -- a lonely hilltop where they will be safe from predators. Facing a river, farm animals, cemetery rats, and the elements, the brave rabbits make their journey across the countryside. However, Hazel realizes that they need more rabbits if they are to survive, and a nearby warren seems the perfect target for this. 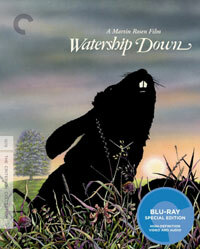 I'm sure that over the years, many have labeled Watership Down as an "odd" movie, but that is a misnomer. The film really defies classification. Here we have an animated film about rabbits. This must be a cute, family-friendly movie, right? Well, not exactly. The movie is quite somber and serious, and it doesn't pull many punches when it comes to violence and scary images. The movie tackles some pretty serious issues, such as totalitarian governments and personal freedom. When viewed today, the movie doesn't seem quite as off-putting as it did upon its first release. With the influx of Japanese animation into the West, we are now far more accustomed to animated films tackling dark and often controversial topics. But, in a pre-Akira world, Watership Down seemed like a truly bizarre piece of art. This presumably means that there were a number of parents who took their kids to see the film and were shocked by what they found. Conversely, there are probably millions of adults who have never gone near the film because it is animated. That latter group is really missing, as Watership Down is a great movie. The film features most everything that one would want in a movie. There are well-drawn characters (no pun intended), a multi-layered story, action, emotional moments, and even comic relief from a foul-mouthed bird. Admittedly, the story is a bit episodic, but those who are willing to give the movie a chance will be drawn into the world of Hazel, Fiver, and Bigwig, and will root for these rabbits to escape their oppressors and find freedom. And you'd have to be a pretty cold person to not be moved by the ending. Richard Adams' novel Watership Down is a monumental tale which offers both the story of the rabbits and legends of the original rabbit, and there's no doubt that those familiar with the book will see that Writer/Director Martin Rosen has cut out a good chunk in order to make the movie. Still, the important parts remain and I feel that the spirit of the novel is definitely intact. Now, I'm not sure if I can tell you what everything represents, as Watership Down feels like one giant allegory, but the story clearly has many layers -- one can simply enjoy the story of rabbits on the run, or delve deeper into what the film is saying about taking a chance and living the life that you choose. The bottom-line is that the film is very entertaining and holds up well over 35 years later. If you've never seen Watership Down because you viewed it as "that bunny movie", do yourself a favor and check it out. Watership Down doesn't do much for the reputation of cats on Blu-ray Disc courtesy of The Criterion Collection. The film has been letterboxed at 1.85:1 and the Disc contains an AVC 1080p HD transfer which runs at an average of 35 Mbps. The image does show some issues. There is a noticeable amount of grain on the image throughout most of the film, and some minor defects from the source material crop up from time to time. The clarity of the HD transfer has revealed some interesting things, such as obvious paintbrush strokes on the backgrounds. Some many accuse the colors of looking washed out, but the filmmakers' intention was to have a watercolor look, so that's probably not accurate. The Disc carries an LPCM 2.0 audio track which runs at 48 kHz and a constant 2.3 Mbps. I hate to criticize something where someone has clearly done a lot of work, but the stereo effects don't work here. The mix does a great job of placing off-screen sounds in the right and left channels when appropriate, but the recording level used wasn't high enough. Therefore, we have characters off-screen talking, but we can't hear them. The Watership Down Blu-ray Disc contains a small assortment of extras. "Passion Project: Martin Rosen on Watership Down" (16 minutes) is a modern-day interview with the director who gives a very detailed account of the film's creation. Starting with the fact that he had no idea how to make movies, but with a desire to see this book on screen, Adams describe how he sought financing, put a team together, and learned by trial and error how to make a movie. "A Movie Miracle: Guillermo Del Toro on Watership Down" (12 minutes) has the filmmaker discussing his first exposure to the film and how it changed his attitude of animation. From there, he talks about the history of animation and how the medium has many different branches. "Defining a Style" (13 minutes) is a featurette from 2005, in which the animators describe their work on the film. One of the main subjects here is the style of the film and how the movie contains several different looks. The film can be viewed with "pop-up" Storyboards which can be compared to the art in the movie. The final extra is a TRAILER for the film.